The city of Eisenach in East Germany is probably most well-known for its copies of BMW. It was the home of the EMW (see blue propeller, red propeller) . However, the city of Eisenach also turned out cars under another brand, and from 1957 to 1960 it turned out a sporting coupe. That coupe was the Wartburg 313, or the Wartburg Sport as it was also known. It was based on the more sedentary Wartburg 311 sedan, which was itself an evolution of the EMW 309, which was in turn a copy of the post war BMW, which was really a pre-war BMW. Follow ? 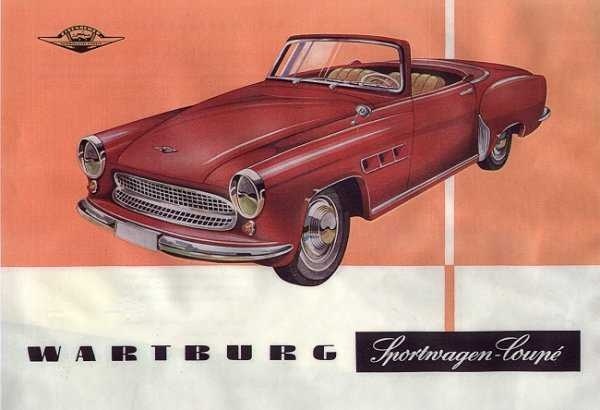 The idea behind the Wartburg 313 was to create a sports car which would be competitive with the Porsche 356, BMW 507 (see the halo and the hail mary), and the Mercedes 300SL. A very lofty goal at the time. Both a Coupe and a Cabriolet version were produced, similar to the other German marques. The car was 172 inches (436 cm) in length and weighed just 2050 lbs (930 kg) It produced 50 hp and a top speed of 86 mph (140 km/h) from a 3 cylinder two-stroke 900 cc engine. This was well down on the intended competition, which was already between 70 and 150 hp. In addition, the timing of the car was not the best, so although the car was exported to West Germany, England, and the USA, few met with willing buyers. In the three years of production, only 469 were made.